Information Access and Availability in the Developing World: Why Should We Care? How Does Research4Life Make A Difference? Join your colleagues with an interest in the inequities of access to the medical, biological, and environmental literature for an inspiring talk by Kimberly Parker of the World Health Organization. In her role as the Hinari Programme Manager at the World Health Organization, Kimberly has nurtured a complex international partnership that now delivers the research literature to people in over 100 countries. These programs provide free access to the subscription-based research literature alongside openly available publications. They also ensure the necessary education on the use and reuse of that literature to those in less developed countries. 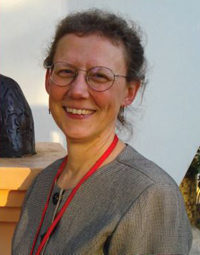 Kimberly was awarded the T. Mark Hodges International Service Award by the Medical Library Association in 2015 for her contributions to expanding access to health information, and in the same year the Hinari program won the Louise Darling Medal for Collection Development in the Health Sciences. Following the talk, there will time for discussion.